Colors play a very important role in Byzantine iconography. The choice of color has a certain symbolism. Gold is reserved for Christ and symbolizes divinity. In addition blue, red and green are also reserved for Christ and Virgin Mary. Christ’s inner garment is red and symbolizes His true divinity; His outer garments are blue and symbolize the true humanity He took on. The stars on the Virgin’s veil represent her purity and goodness. The colors of white, gray, blue, green, and light shades of red are used for other holy persons. On the icons, the eyes are large and wide because they have seen great things beyond the material world. The forehead is often large and high, expressing spiritual wisdom. The ears are large to listen the words of God. The nose is drawn long and thin. The gentle lips indicate that the saint obeyed God, and also that he needed only a small amount of food to survive. In Orthodox iconography, the halo symbolizes the holiness of the person. In the creation of an icon, quality wood is chosen, sanded and coated with a linen fabric. It is then dipped in lukewarm rabbit skin glue to prevent the painted surface from cracking. After applying five layers of chalk mixed with rabbit glue, the board is sanded and is ready to be painted. Then, follows the transfer of the sketch of the saint or scene. Several coats of shellac are then applied, followed by a special glue used for oil gilding. After many hours, the gold leaf is applied. This is a delicate procedure that demands great experience. Egg tempera is the basic medium in icon painting. Egg yolk diluted with water and mixed with natural pigments create the paint used in successive layers of color so as to create translucent subtle gradations from dark to light. Byzantine iconography is the oldest and only Christian art form which has continued unchanged for the past 2000 years. The term icon itself simply means image. The Eastern Orthodox believe that the first icons of Christ and the Virgin Mary were painted by St. Luke the Evangelist. St. Luke is the Patron Saint of iconographers. Iconography is considered to have begun the day our Lord Jesus Christ pressed a cloth to His face and imprinted His divine-human image thereon. According to Tradition, Luke the Evangelist painted the image of the Mother of God; and, also according to tradition, there still exist today many Icons which were painted by him. An artist, he painted not only the first Icons of the Mother of God, but also those of the holy Apostles Peter and Paul, as well as possibly, others. 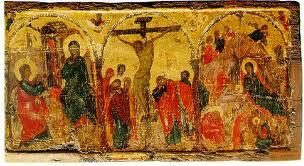 Iconography did not develop further during the time of the Roman persecutions, but Christians did attempt to express in symbols what they wished to convey. Christ was portrayed as the Good Shepherd and in the guise of various personalities from pagan mythology. Then, when Constantine became emperor, Christians were free to express themselves. As Christianity quickly transformed the Roman Empire and replaced paganism, iconography flourished with full force. Directives concerning Iconography were recorded in the first ecumenical councils. All genuine icons are replete with symbolism which conveys information about the person or event depicted. Icons are formulaic in character because they must follow a prescribed methodology indicating how a particular person should be depicted, including hair style, body position, clothing and background details. Christ founded His Church in order to inspire, to transfigure the world and to cleanse it from sin . . . in other words to redeem it. While Christianity was founded on earth and operates there, it reaches to Heaven. Christianity is that bridge and ladder whereby men ascend from the earthly Church to the Heavenly Church. A simple representation which recalls the earthly characteristics of some human face is not considered an icon. The value of an Icon lies, rather, in the fact that, when we approach it, we want to pray before it with reverence. If the image elicits this feeling, it is an icon. An icon must indeed depict that which we see with our eyes, preserving the characteristics of the body’s form, for in this world the soul acts through the body. At the same time, the Icon must point towards the inner, spiritual essence. In depicting saints, the task of the Iconographer is precisely to render, as far as possible, those spiritual qualities whereby the person depicted acquired the Kingdom of Heaven, won an imperishable crown and obtained the salvation of his soul. As a daily guide, the icons, in calling to mind the saints and their struggles, depict the inner spiritual struggle of the saint; portraying how that saint attained the heavenly goal. Icons should depict that transcendent sanctity which permeated the saints. All saints should be depicted so as to convey their individual characteristics as much as possible. Just as soldiers should be portrayed as arrayed for battle, so holy hierarchs should be portrayed in their episcopal vestments. Icons of Jesus Christ must depict the union of all that is human and all that is divine. The Savior must be revealed so that we sense He is a man, a real man, yet at the same time something more exalted than a man. This means that we do not simply approach Him as we approach an ordinary human. Rather, we should feel that He is One who is close to us, our Savior both merciful and just, who desires us to follow Him and who wishes to lead us to the Kingdom of Heaven. In the Painter’s Manual, preserved in Mount Athos in Greece, the Icon master advises the one who aspires to become an icon painter to pray before the icon of Christ and that of the Mother of God because the art of painting comes from God.